The island of Lido di Venezia (Venice): info, beach, ferries and buses. The island Lido di Venezia is an extremely long and narrow island in Venice. It is part of the natural boundary between the lagoon of Venice and the sea. Together with the southern neighbouring island of Pellestrina and a peninsula in the north, the island of Lido is a natural shelter of the main island of Venice from the open sea. Lido is one of the few islands of Venice where there are roads, buses and cars. Lido di Venezia has a long sandy beach and has been an important tourist destination since the middle of the 19th century. 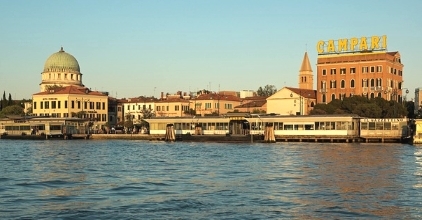 From Lido you can reach the old town of Venice in a few minutes by very frequent ferries. The island of Lido belongs politically to the city of Venice. It has an enormous length of 11 kilometres in direction north-south, but it is only a few hundred metres wide. The island has a total size of only four square kilometers. The outlines of the island on a map remind us something of Chile. A road leads through the whole length of the island. Buses run several times an hour on this road. Thus one can look at the island Lido in the context of a day trip also without own vehicle without problems. Many tourists choose a hotel on the island of Lido, especially in summer. Advantages are the very fast transfer by water bus to Venice. You can get from the port to Lido by ferry in a quarter of an hour in the center of Venice (Piazza San Marco). Lido has also a good beach, nightlife and much more. The vaporetti (water buses, ferries) dock on Lido at the pier "Lido Santa Maria Elisabetta". On maps, plans and the like, the small port on the island of Lido is often abbreviated as "Lido S.M.E.". It is on the lagoon side of the island protected by the open Adriatic Sea. From the port you can look over to the old town of Venice. In the background you can see the famous buildings around St. Mark's Square. The crossing with the vaporetto ship to the first stops on the main island of Venice takes only a few minutes. A few moorings later, after approximately 15 minutes, you are near St. Mark's Square. Many passenger ships go on to the main train station of Venice Santa Lucia. From Lido Santa Maria Elisabetta there are also water buses without changing to Murano and other islands. During the day there is a boat to St. Mark's Square every few minutes. The tickets for the Vaporetto ferries are not exactly cheap. A one-way trip costs 7,50 Euro at the beginning of the year 2019. However, there are for example day tickets and above all inexpensive multi-day tickets. The ferry port Lido S.M.E. is located in the northern third of the island. Around the port is something like a small downtown of Lido - including a short pedestrian zone, many shops, cafes and so on. Further north is the old airport of Venice. Today, this is no longer used in scheduled traffic. Up to the northern tip of the island Lido it is about 2 to 3 kilometres from the ferry dock, to the southern tip about 8 to 9 kilometres. The several kilometres of beach of Lido is on the other side of the island. Because Lido di Venezia is very narrow, it is only a few hundred meters on foot to the beach from the ferries. The long island of Lido is in the east of Venezia. The most important bus on the island is the city bus line 11, which connects the ferry port of Lido Santa Maria Elisabetta with the south of Lido and with the neighbouring island of Pellestrina. In less than 2 hours you can reach the city of Chioggia on the mainland in the south of the lagoon. The bus runs at least every 30 minutes during the day. Single tickets for bus and tram within Venice cost only 1.50 Euro. Both Lido and the island Pellestrina belong to Venice. Some other bus lines go from the port Lido Santa Maria Elisabetta to the north of the island Lido di Venezia. There is a lot going on at Lido every year when the international film festival takes place. It is in the middle of the high season for about 10 days (mostly a few days in August and September). The most important building of the film festival is the Palazzo del Cinema. It is about 1.5 kilometres south of the port of Santa Maria Elisabetta on the east side of Lido, near the beach. The film festival is only a part of a big Biennale di Venezia. It is a festival for art and, in annual rotation, for architecture. Most events are not on Lido, but in the eastern part of the main island of Venice in the district (Sestiere) Castello. Many countries have their own well-known pavilion (American Pavilion, German Pavilion, Australian Pavilion etc) with a long tradition. The site is located on the island of Venice directly opposite the island of Lido and can be reached from the port of Lido S.M.E in a few minutes by very frequent ferries (see above). No hotel in Venice yet? There are thousands hotels and other accommodations in and around Venice. In our opinion the best overview for 2019 is at Booking.com. You can also search for a hotel in the district of Mestre on the mainland at Booking.com. In this suburb accommodation is usually cheaper. From Mestre you can quickly go to the historic old town of Venice by train, bus or tram. Summary: Although none of Venice's top attractions are to be found on Lido, the island is still worth a visit. The beaches are very beautiful. Many tourists stay on the island Lido, as the heart of Venice (San Marco) is only a few minutes away by ferry.